Wedding Paper Divas is still offering 8 free wedding invitation samples. All you have to do is use the code FREETRY during checkout. There's no expiration date published but as far as I'm concern it's only for a limited time only. Hurry now, especially if you are a winter bride! 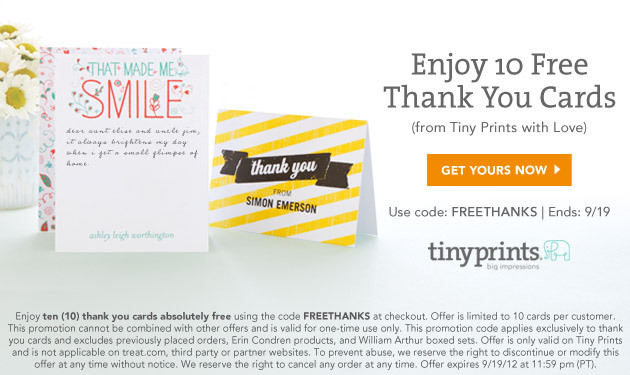 Tiny Prints wants you to enjoy three (3) stationery samples absolutely free using the code 3FREESAMPLES at checkout. This offer is for a limited time only. Two words not said enough, by bosses, by spouses, by friends, or by strangers on the street. Tiny Prints is out to change that. These cards can be completely customized and personalized to your tastes. Choose from thousands of designs, add pictures, change the text, the fonts, the colors. You get to make these cards uniquely you.